"To the moon, Alice!" There was a time when you could say that phrase and immediately most everyone knew exactly who you're talking about: 'The Great One." The fine actor and comedian Jackie Gleason will forever be associated with his role of bus driver Ralph Cramden on the popular TV series, "The Honeymooners." But there was another side to Jackie that few people know about. Gleason was an extremely serious armchair UFO researcher, and prided himself on his huge collection of UFO-related books, which numbered into the thousands. As soon as a new title came out, even in Europe or the UK, Jackie had a copy. Little did he suspect that his interest in that topic would one day gain him access to something that most people would never even believe, and would leave others who shared his interests either skeptical or forever jealous. 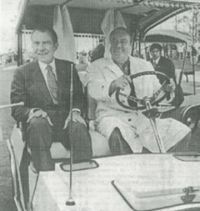 It was a chance conversation one afternoon, back in 1974 in Florida, while Jackie was playing golf with one of his regular partners, President Richard Nixon. Jackie had mentioned his interest in UFOs and his large collection of books, and the president admitted that he also shared Jackie's interest and had a sizeable collection of UFO-oriented materials of his own. At the time, the president said little about what he actually knew, but things were to change drastically later on that same night. "We drove to the very far end of the base in a segregated area, finally stopping near a well-guarded building. The security police saw us coming and just sort of moved back as we passed them and entered the structure. There were a number of labs we passed through first before we entered a section where Nixon pointed out what he said was the wreckage from a flying saucer, enclosed in several large cases. Next, we went into an inner chamber and there were six or eight of what looked like glass-topped Coke freezers. Inside them were the mangled remains of what I took to be children. Then - upon closer examination - I saw that some of the other figures looked quite old. Most of them were terribly mangled as if they had been in an accident." "You could tell that he was very sincere - he took the whole affair very seriously, and I could tell that he wanted to get the matter off his chest, and that was why he was telling me all of this. Jackie felt just like I do, that the government needs to 'come clean,' and tell us all it knows about space visitors. It time they stopped lying to the public and release all the evidence they have. When they do, then we'll all be able to see the same things the late Jackie Gleason did." The United States government's knowledge about UFOs and their occupants exists at the very highest levels of security, above even atomic weapons and things of that nature. Information is imparted on a strictly "need to know" basis, and this has left even many presidents in the dark on the subject. Obviously, Richard Nixon wasn't one of them. One can only imagine what technology and evidence of life outside of this Earth exists in the back corners and hidden labs of the American military, but for anyone who doesn't believe that this situation is real, this story about Jackie Gleason is just the very tiny tip of the iceberg. We may be waiting a very, very long time, indeed, until Jackie's dream of government disclosure comes true.